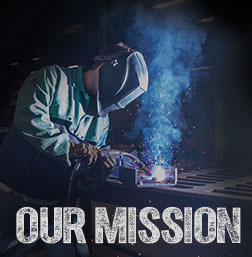 Most structural steel fabrication orders require a number of finishing steps, including cutting to size, punching and rolling. Ernest-Spencer utilizes top of the line structural steel machines in all areas to get the job done with precision and efficiency. The Ocean Avenger line drilling system uses a CNC-driven travelling spindle to accurately and efficiently drill pre-programmed hole patterns along structural material positioned on the 55' worktable. The Ernest-Spencer production floor utilizes multiple ironworker systems with varying capabilities, including the Piranha P90 (90 ton) and P50 (50 ton). The ironworker functions as a flexible fabrication cell, providing a range of metalworking functions in a single workstation. This helps reduce lead times on "hot" projects and custom orders. We offer both automated and manual cutoff sawing capabilities. Cutting Accuracy: +/- , 015"
Maximum Material Profile: 25" x 30"
Our structural steel roll offers versatility in material types and shapes. With our variable speed 3-roll drive system we can roll almost any small - to medium-sized structural steel stock.